Every day, ROSS team members do outstanding work to build and maintain a portfolio of exceptionally managed apartment communities. On Wednesday, April 19, those employees got a well-deserved day in the spotlight. 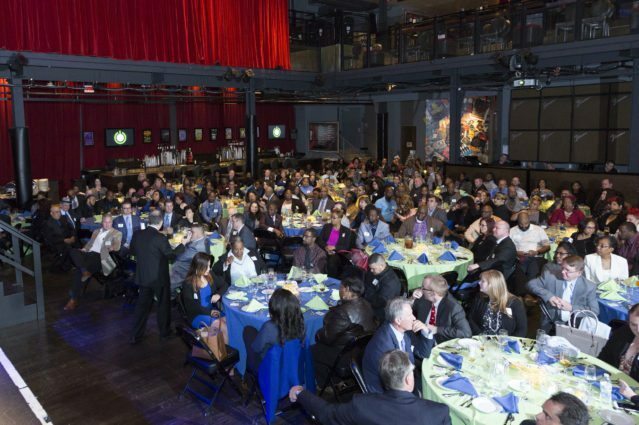 The occasion was ROSS Companies’ Annual Employee Recognition Event, held this year at The Fillmore Silver Spring. With a theme of “The Power of You,” the festivities emphasized the ability of team members to drive ROSS and its communities to even greater heights. Arnold Sanow, a leading expert on improving customer and workplace relationships and the author of six best-selling books on business success, was the event’s featured speaker. He shared tips on improving relationship IQs and making good impressions on both customers and co-workers. After Sanow’s presentation, the community and individual award recipients were announced. The prestigious Community of the Year Award is split into two categories: one for communities with under 275 apartment homes and one for those with more. Grandview Apartments in Falls Church, Va., won the Under 275 award and Seven Springs Apartments in College Park, Md., took home the Over 275 honor. Customer Service Circle of Excellence: Charlestowne North in Greenbelt, Md. Highest Increase In Online Payments: Seasons at Bel Air in Bel Air, Md. Best Collections of the Year: Metro 710 in Silver Spring, Md. Most Improved Community of the Year: Park Greene Apartments in Suitland, Md. As for individual awards, Larry Austin of Coliseum Lofts in Richmond, Va., was named the Property Manager of the Year, which honors the property manager with the best overall community performance as measured by occupancy, expenses, community inspections income, NOI and recommendations from RPM. Assistant property managers have become increasingly important both and ROSS and throughout the industry. This year, Millie Heyward of Seven Springs Apartments in College Park, Md. won Assistant Property Manager of the Year. Sales Person of the Year: Ahshanté Branch of Seven Springs Apartments in College Park, Md. Telephone Presentation Excellence: Fereshteh Coley of Enclave Silver Spring and Spring Parc, both of which are in Silver Spring, Md. Sales Circle of Excellence (Gold): Larry Austin of Coliseum Lofts and Yolanda Hanley of Colesville Towers in Silver Spring, Md. Reputation Management Award: George Fenwick of Seven Springs Apartments in College Park, Md. Social Media Award: Catherine Quintanilla of Seven Springs Apartments in College Park, Md. Maintenance Supervisor of the Year: Milton Perry of Overlook Apartments in Hyattsville, Md. Maintenance Technician of the Year: Martin Vasquez, Charlestowne North in Greenbelt, Md.